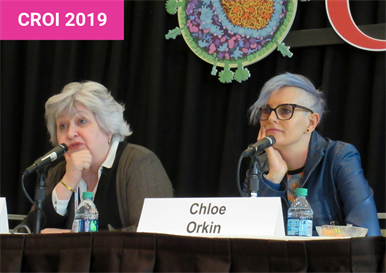 Susan Swindells and Chloe Orkin presenting at CROI 2019. Photo by Liz Highleyman. What's more, study participants expressed a high level of satisfaction with monthly injections compared with daily pills, and nearly all said they would prefer to use the injectable method, reported Dr Susan Swindells of the University of Nebraska Medical Center and Dr Chloe Orkin of Queen Mary University of London. The phase II LATTE trials previously demonstrated that a simplified oral regimen of cabotegravir plus rilpivirine is effective as maintenance therapy. This supported the evaluation of injectable formulations of the two drugs in previously untreated patients. As reported at the 2016 International AIDS Conference, 91% of people who received the injections every 4 weeks and 92% of those who did so every 8 weeks had undetectable viral load at week 48. This set the stage for larger phase III trials. ATLAS (Antiretroviral Therapy as Long-Acting Suppression) evaluated injectable cabotegravir plus rilpivirine in people who switched from a standard oral antiretroviral combination with an undetectable viral load, while FLAIR (First Long-Acting Injectable Regimen) tested the injectables in people starting HIV treatment for the first time. Cabotegravir and rilpivirine were administered as two separate intramuscular jabs, with the buttocks being the preferred injection site. All injections were given by health care providers. Patients were asked to return to their clinics each month and were given a seven-day window in which to do so. Adherence was good in both studies, with almost all participants receiving monthly treatment within this window. Use of injectable therapy would be "a big paradigm shift" in how we offer treatment, according to Orkin. "It can be done – we haven’t done it in HIV, but it's done in other areas of medicine," she said, pointing out that long-acting depot formulations are widely used for psychiatric drugs and contraception is commonly administered as injections every month or two. The ATLAS trial, presented by Swindells, included 616 treatment-experienced patients. A third were women, two thirds were white, about a quarter were black and the median age was 42 years. They had been on antiretroviral therapy for a median of four years, all had viral suppression and the median CD4 count was 653 cells/mm3. At baseline, half were taking NNRTI-based regimens, a third were taking integrase inhibitors and 17% were on protease inhibitors. They were randomly assigned to either stay on their current oral regimen or switch to injectable cabotegravir and rilpivirine. To ensure safety, participants in the latter group took cabotegravir and rilpivirine pills for a month before switching to injections. Rates of virological non-response, defined as HIV RNA at or above 50 copies/ml, were very low in both groups: 1.6% with injectable cabotegravir and rilpivirine versus 1.0% with the continued oral regimen. Virological success rates were 92.5% and 95.5%, respectively. These results showed that the injectables were non-inferior to continued oral therapy. Three individuals who received the injectables (two from Russia and one from France) had confirmed virological failure at week 8, 12 and 20 and showed evidence of reverse transcriptase or integrase resistance-association mutations. All had 'A' subtypes of HIV. The FLAIR trial, presented by Orkin, included 556 people starting their first HIV treatment. Just over 20% were women, nearly three quarters were white, 18% were black and the median age was 34 years. At baseline, a fifth had a viral load of 100,000 copies/ml or higher and the median CD4 count was 444 cells/mm3. Participants started with a three-drug induction regimen of co-formulated dolutegravir/abacavir/lamivudine (Triumeq) for 20 weeks to bring down virus levels. They were then randomised to either stay on this regimen or switch to injectable cabotegravir and rilpivirine, again starting with oral formulations of these drugs for the first month. Here too, virological non-response rates were low, at 2.1% in the injectable group and 2.5% in the oral therapy group. Virological success rates were 93.6% and 93.3%, respectively, again demonstrating non-inferiority. Three people, all from Russia and with HIV 'A' subtypes, had confirmed virological failure and showed evidence of resistance-associated mutations. In both studies, pharmacokinetic data showed that cabotegravir and rilpivirine concentrations in the blood remained above effective thresholds throughout the study and were similar to levels reached with the corresponding oral formulations. Treatment was generally safe and well tolerated. Serious adverse events were rare among people using cabotegravir and rilpivirine (none in ATLAS and one in FLAIR). There were no cases of drug hypersensitivity or liver toxicity. In both trials, 3% of participants stopped treatment with the injectables due to adverse events. Injection site reactions – predominately pain – occurred in 20% to 30% of participants. These were most common early in the study, were generally mild or moderate and improved over time, lasting a median of three days. Four people in ATLAS and three in FLAIR dropped out due to injection site reactions. The researchers also evaluated patient satisfaction and preferences, finding that those receiving the injectables were more satisfied with their treatment. The increase in satisfaction was especially notable in ATLAS, where participants were coming off daily oral therapy. A large majority said they preferred the injectables over pills (86% of all patients and 97% of survey respondents in ATLAS; 91% and 99%, respectively, in FLAIR). Swindells acknowledged that as a provider, she found it surprising that some patients prefer injections to pills, but they do. "They like not having to worry about taking their pills every day…they get their injection and they're good to go," she said. "They don't have to think about having HIV every day, they don't have to worry about co-workers or housemates seeing their pill bottles – there's maybe some relief of the stigma of HIV if they don't have to think about it every day."